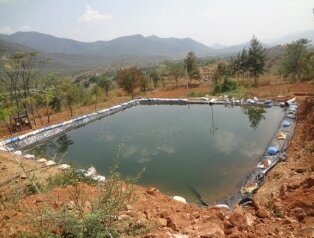 Anisha’s facilities include a 9-acre working organic farm. Working under the same conditions as the local farmers, keeps Anisha closely connected with the challenges these people face. . The farm has numerous demonstration plots (see herbal garden above) that are used to conduct trials to determine the compatibility of various seeds and methods within the context of the Martalli region. Anisha’s staff systematically test and document how various native seeds, which have been brought from other areas of India, grow in Martalli. In addition, several forms of organic fertilizer and pest control are piloted and refined on Anisha’s test plots. Based on the outcomes from this research, Anisha recommends certain varieties of seed or organic farming methods to the farmers with whom it works. The seeds are distributed through Anisha’s seeds bank. Farmers visit the demonstration plots and several have been persuaded to switch to organic farming only after observing the high yields and healthy crops grown on Anisha’s farm. Water is conserved by using only sprinklers and drip to water the trial plots and plants and by catching rain water from the monsoon season in a number of water basins. Permaculture (click for report 2014) is also practiced and taught at Anisha. It allows even the tiniest patch of land and slopy edge to be developed to grow something substantial in a very short time.